NASA's Mars Exploration Rover Spirit spent the Martin Luther King, Jr. holiday weekend analyzing a remarkable exposure of bright, loose material. 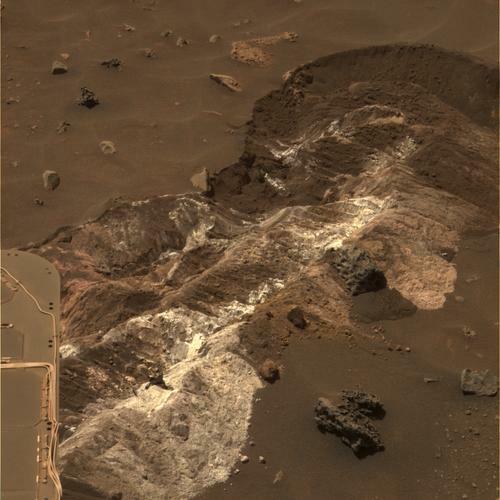 Spirit discovered the material while driving toward "Home Plate" along the floor of the basin south of "Husband Hill" in Gusev Crater. These images from Spirit's panoramic camera (Pancam) show some of the most colorful deposits yet photographed on the surface of Mars. Spirit uncovered several types of materials distinctive in their color, physical properties and chemistry as a result of accidentally digging a trench 30 centimeters (11.8 inches) wide during a turn at the end of a drive. The white material in this image is brighter than any seen previously by the rover. It has a powdery and cloddy texture and exhibits a high abundance of salts. The materials appear similar in some ways to bright soil deposits seen back at the "Paso Robles" site that Spirit encountered on the rover's Martian day, or sol, 431 (March 20, 2005) while climbing the northern flank of "Husband Hill." Spirit analyzed the bright, yellowish exposures in the lower left part of the frame using instruments on the rover's robotic arm. Scientists hypothesized and then confirmed that these materials have a salty chemistry dominated by iron-bearing sulfates. These salts may record the past presence of water, as they are most easily mobilized and concentrated in liquid solution. Spirit also examined the unusual, pitted rock about 10 centimeters (4 inches) wide in the lower center of the frame. Scientists continue to study the origin of these rocks and soils and the role that water has played in their formation. This view is an approximately true-color composite combining images taken with the Pancam's 600-nanometer, 530-nanometer and 480-nanometer filters on Jan. 12, 2006, the rover's 721st sol on Mars.